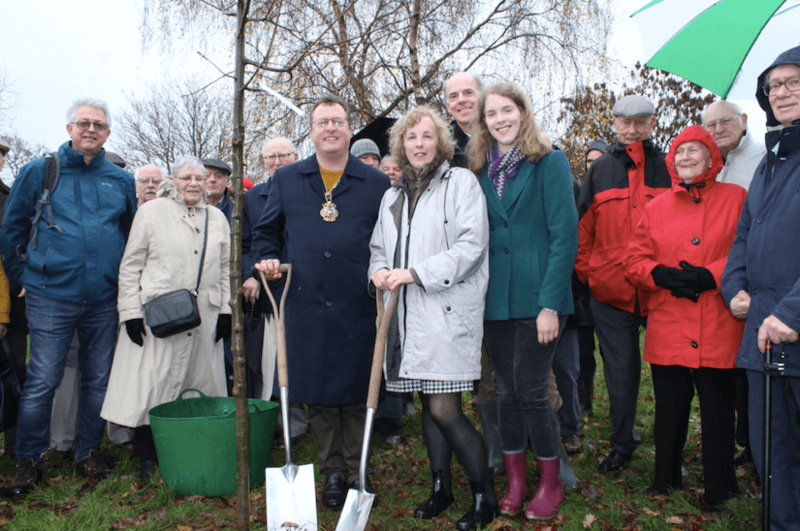 Oak trees have been planted in memory of two former long-standing Exeter City Councillors. David Morrish and his wife Joan Morrish, who between them dedicated 80 years of political service to Exeter and Devon, died earlier this year. David was 86 years old and Joan 91. The City Council wanted to provide a lasting and living memory of the couple by planting a pair of oak trees in Heavitree Pleasure Ground, a park they were very familiar with, which is situated within David’s former ward. Exeter Lord Mayor Cllr Rob Hannaford carried out the planting in the presence of David and Joan’s daughter, Claire Thorogood, her husband David and their granddaughter Emma. He paid tribute to the couple’s popularity, their tireless work as councillors and the legacy they had left in the city. David served as a City Councillor for Heavitree and in 2011 was made a Freeman of the City. He amassed a total of 50 years combined service on both Exeter City and Devon County Councils. Joan was a member of the City Council for 20 years, representing the St Loyes ward. When she retired from politics in 2012, she was the last remaining Liberal on the City Council. She was Leader of the Liberal Group on the Council and served on the cross-party group that won unitary status for Exeter in 2010 only to have the decision later reversed. She was also a Devon County Councillor for 10 years. Away from politics, Joan will also be remembered by hundreds of former teachers and pupils at the former St Thomas High School, where she was Deputy Head Teacher up until her retirement in 1988.